Buxton ran into the wall in the eighth inning. 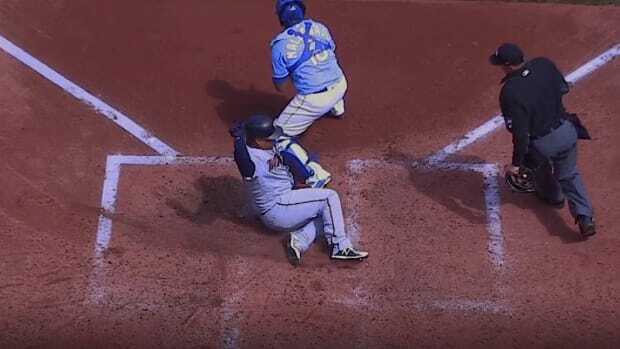 Byron Buxton left Tuesday night&apos;s game between the Twins and Royals with an injured back after crashing into the center-field wall. 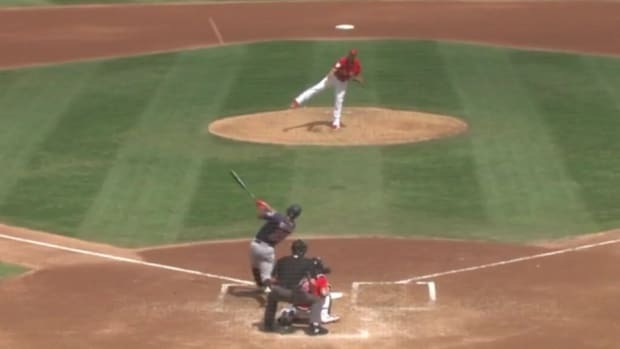 The play happened in the bottom of the eighth inning when Adalberto Mondesi ripped a ball over Buxton&apos;s head and off the wall for an inside-the-park home run. Buxton&apos;s attempt to make a leaping catch was unsuccessful, and he slammed his back into the wall. The Twins say Buxton suffered a back contusion and his status for Wednesday&apos;s matinee against the Royals is unknown. The good news is that his injury doesn&apos;t sound serious. Buxton added 21 pounds of muscle during the offseason, saying during TwinsFest that part of his aim by bulking up was to better absorb contact in collisions like he had Tuesday night. The Twins won the game 5-4 in 10 innings. The decision keeps Buxton under team control one extra season. Maybe this is the year Buxton puts it all together. Buxton was down for a while before being able to get to his feet. He hurt his hand during an at-bat Thursday night. Buxton's finally free of pain from a hairline toe fracture.